The 2018 New York state elections took place on November 6, 2018. 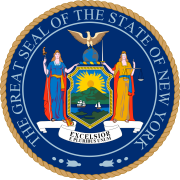 On that date, the State of New York held elections for the following offices: Governor and Lieutenant Governor (on one ticket), Attorney General, Comptroller, U.S. Senate, U.S. House of Representatives, New York State Senate, New York State Assembly, and various others. Primary elections took place on September 13, 2018. While each party's candidates for Governor and Lieutenant Governor form a combined ticket in the general election, each party's candidates to the two posts run separately in the primaries. Democrats have won all 19 elections to statewide offices that have occurred in New York since 2002. Incumbent Democratic Governor Andrew Cuomo was re-elected to a second term in 2014. Cuomo has announced that he plans to run for a third term in 2018. As of July 15, 2018, Cuomo's challengers include Marcus Molinaro (Republican, Conservative and Reform candidate), Cynthia Nixon (Working Families Party candidate who is also challenging Cuomo in a Democratic primary), Howie Hawkins (Green Party candidate), Larry Sharpe (Libertarian Party candidate), and independent candidate Stephanie Miner. Lieutenant Governor Kathy Hochul intends to seek re-election to her current post. Democratic New York City Councilmember Jumaane Williams is also seeking the Democratic nomination for Lieutenant Governor and has received the nomination of the Working Families Party. Julie Killian is the Republican nominee for the position, Jia Lee is running for the Greens, Andrew Hollister is the candidate for the Libertarians, and Miner has chosen Republican Michael Volpe, mayor of Pelham, as her running mate. Incumbent Democratic Attorney General Eric Schneiderman, who has been in office since 2011, was re-elected in 2014 with 56% of the vote. On May 7, 2018, he resigned his position, the day that an article in The New Yorker reported detailed allegations of abusive behavior toward several women he had dated during his time in the office. A joint session of the New York State Legislature appointed Solicitor General Barbara Underwood to fulfill the remainder of the term; Underwood agreed not to pursue election to a full term. New York City Public Advocate Letitia "Tish" James secured the state Democratic Party official endorsement in May 2018; Leecia Eve, Sean Patrick Maloney and Zephyr Teachout challenged her in the Democratic primary. The Republicans nominated Keith Wofford for the post. James prevailed in the Democratic primary on September 13, 2018 with 40.6% of the vote. Incumbent Democratic Comptroller Thomas DiNapoli, who has been in office since 2007, was re-elected in 2014 with 60% of the vote. Jonathan Trichter, a campaign operative and former public finance banker, has received the Republican nomination despite his past Democratic Party enrollment. Incumbent Democratic Senator Kirsten Gillibrand is running for re-election to a second full term. The Republican Party has nominated private equity executive Chele Chiavacci Farley to challenge Gillibrand. All of New York's twenty-seven seats in the United States House of Representatives will be up for election in 2018. The New York State Senate is the "last bastion of power" of the Republican Party in the State of New York. District 58 (Southern Tier) (seat currently held by Republican Sen. Tom O'Mara). All 150 seats in the New York State Assembly will be up for election in 2018. The chamber's Democratic supermajority is expected to remain unchanged. ^ "2018 POLITICAL CALENDAR" (PDF). New York State Board of Elections. March 13, 2018. ^ Mahoney, Bill (May 24, 2018). "How New York's GOP hopes to avoid a 'blue wave'". Politico. Retrieved October 23, 2018. ^ Lovett, Kenneth (November 15, 2016). "Gov. Cuomo plans to seek reelection despite considered possible 2020 presidential candidate". Daily News. New York. Retrieved November 15, 2016. ^ Precious, Tom (January 17, 2018). "Hochul makes it clear: She will run for re-election". Buffalo News. Retrieved April 10, 2018. ^ Harding, Robert (2018-02-21). "Jumaane Williams aims to become 'people's lieutenant governor'". AuburnPub.com. Retrieved 2018-04-10. ^ "Planned Parenthood endorses Hochul, knocks Williams for LG". July 11, 2018. Retrieved August 28, 2018. ^ Lovett, Kenneth (January 18, 2016). "New York City politicians putting together finances eyeing 2018 statewide campaigns". New York Daily News. Retrieved November 18, 2016. ^ "GOP backs Keith Wofford for attorney general". Retrieved August 28, 2018. ^ "No Need to Flash-Forward to 2021: Mayoral Hopefuls Already Engaged". Retrieved 2018-09-20. ^ "Letitia James Makes History by Winning Attorney General Primary in New York". Retrieved 2018-09-15. ^ Harding, Robert (March 7, 2018). "Jonathan Trichter preparing to challenge NY Comptroller Tom DiNapoli". AuburnPub.com. Retrieved April 10, 2018. ^ "For comptroller, GOP unanimously backs Trichter, a new Republican". May 24, 2018. Retrieved August 28, 2018. ^ Jimmy Vielkind (2018-03-02). "Republicans nominate Chele Farley to make their case against Gillibrand". Politico. Retrieved 2018-03-20. ^ "Democrats Win New York Senate Races". Wall Street Journal. April 24, 2018. Retrieved October 23, 2018. ^ "Fifth GOP state senator in a week announces retirement plans". May 3, 2018. Retrieved August 28, 2018. ^ a b "New York State Senate elections, 2018 - Ballotpedia". Retrieved May 22, 2018. ^ Lewis, Rebecca (May 3, 2018). "An updated guide to the 2018 state Senate elections". City & State. Retrieved September 4, 2018.